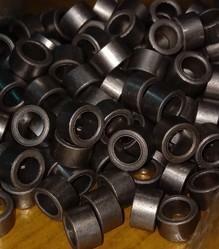 We are amongst the most reputed names in the industry, offering Sintered Bronze Bearing. Self Lubricating Bush which is in the same structure and properties as DU/MU. But outer layer is bronze plated which is highly corrosive resistance. Application: Automobile, food-processing machinery, pharmacy machinery, beverage machinery, medical equipment etc. Widely used in Automobile and Household Applications, the self-lubricating bush does not require a constant oil supply. 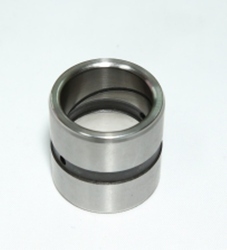 The inherent porosity is the main reason this product is manufactured via Powder metallurgy process. Using our in-house oil impregnation facility, minimum 10 to 20 % by Volume Oil Content is assured. We offer a wide array of lubricating bush fitted with solid non-liquid graphite rod that acts as a lubricant. We offer Self-Lubricated Bearings, Plain Bronze Bushings, Pillow Blocks and Flange Units and other products for the industries that require a Self-Lubricating solution. We also offer the complete line of plain bronze products, specializing in custom bearings, bar stock, washers, bronze wear plates and special machined parts. "End Users will be preferred."